Okey guys, this is the new forum created to make it easier to follow a specific restoration of a particular model of HUS-SKI or Diablo. In addition to this, this forum is your official entry point to win a pair of skiis to be given as a prize at the Diablo 50 Year Anniversary Celebration. Every restoration thread started here between now and January 14, 2017 will receive one chance to win a Hus Ski or Diablo pair of skis. You must also be present with your restoration during the day and at the banquet that evening to accept the prize. There are probably a few guys who have started restorations within the past year, have photos but didn't post them on gogodiablo.com. Any restoration started within the last year and is posted here also qualifies for the ski prize. If you have a restoration post active but in another category, let me know and I can move it to this post if you want it here. I also want to mention that this will be a friendly "risk free no judgment" forum. We realize there are different levels of restoration abilities, but we welcome all work shared. Every day I check the forum and often see many poeple looking around the forum but few people posting. These are the dog days of the forum when many of us have other priorities in our work shops and we spend less time communicating on the forum. 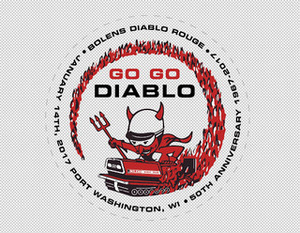 The objectives we had with the Ski Prize offer was to generate excitment for the upcoming Diablo Rouge 50th Anniversary Celebration and also to keep some active posts generating discussion or entertainment through these slow months of summer. I would kindly challenge those restoration projects in the running for the Ski Prize drawing to keep at your projects and post at least several posts each month if possible. There are many fellow enthusiasts out there interested in what you have to share. I would also challenge more of you to "get in the game". This is a perfect time to get that rough Hus Ski or Diablo out from under the cover and get it ready to shine at the celebration while giving yourself a chance to win a pair of the best Hus Ski/Diablo skis in the world! This section of the forum has quickly become my favorite section. Being able to see the progress on all these machines is terrific. Keep up the good work. A few posters have suggested that my 400 restoration will win the skis but of coarse I will not be eligible to win my skis. The point which is important is that there is no judging to take place. If your idea of a restoration is to fill a balloon with paint and throw it at your machine then you have a chance to win the skis so long as you post your efforts here and are present at the 50 year celebration. The winner will be drawn at random from a hat. If you are thinking "I have skis on my restoration. Why would I want another pair? ", then I have an answer for that. If you win skis and don't need them, I will be happy to buy them at market price. By looking at those posting in this forum and comparing it to those coming to the banquet, I guess there will be about a 1 in 5 chance that you could win a pair of Barrie's famous reproduction skis. If you are still thinking of posting some progress pictures of your restoration and also coming to the banquet on January 14th, there is still time to get in on this great offer for a chance to win a pair of skis! Congratulations to snocat Pete for having won the skis.